A. Charlois discovered asteroid #294 Felicia. At Seattle, Washington, timber merchant William Boeing incorporated Pacific Aero Products, a firm later renamed to The Boeing Company. The first airport hotel opened, The Dearborn Inn at Henry Ford's airport at Dearborn, Michigan. Wiley Post began the first solo flight around the world, a trip lasting more than seven days, ending on 22 July. K. Reinmuth discovered asteroid #1750 Eckert. The first flight of the Boeing 367-80 took place, the original prototype of the Boeing 707 which became the first American jet passenger airliner. NASA's Manned Spaceflight Center received 271 Apollo astronaut program applications. Seventy-one were military pilots (one Army, 34 Navy, 26 Air Force, 10 Marines). Of the 200 civilians applying, three were women. NASA's Mariner 4 became the first spacecraft to successfully fly by Mars, passing as close as 9,846 kilometers (6,118 miles), taking the first close-up photographs of another planet. Mariner 4, launched 28 November 1964, was the first spacecraft to get a close look at Mars. Flying as close as 9,846 kilometers (6,118 miles) on 15 July 1965, Mariner 4 revealed Mars to have a cratered, rust-colored surface, with signs on some parts of the planet that liquid water had once etched its way into the soil. In addition to various field and particle sensors and detectors, the spacecraft had a television camera, which took 22 television pictures covering about 1% of the planet. Initially stored on a 4-track tape recorder, these pictures took four days to transmit to Earth. Mariner 4, expected to survive something more than the eight months to Mars encounter, actually lasted about three years in solar orbit, continuing long-term studies of the solar wind environment. Mariner 4 returned to the vicinity of Earth in 1967, when engineers then decided to use the aging craft for a series of operational and telemetry tests to improve their knowledge of the technologies that would be needed for future interplanetary spacecraft. Mariner 4 was well on its way to Mars when an experiment was approved to study the effect of transmitting the spacecraft's radio signal through the Martian atmosphere just before the spacecraft disappeared behind the planet. This experiment would reveal much about the Martian atmosphere. In order to perform the experiment, the spacecraft's computer had to be reprogrammed from Earth. This engineering feat, pioneered on Mariner 4, has since been greatly refined and repeated numerous times in later missions, both for enhancement and salvage. USSR launched Soyuz 19 (Soyuz-ASTP) from Baikonur, the Soviet half of the Apollo-Soyuz Test Project, in preparation for the unprecedented international docking of their spacecraft two days later. On 15 Juy 1975, the US and the USSR launched an Apollo spacecraft (Apollo-ASTP) and a Soyuz spacecraft (Soyuz 19), respectively, as a joint effort called the Apollo-Soyuz Test Project (ASTP), a post-Moon-race 'goodwill' flight to test a common docking system for space rescue. Soyuz 19, with its two man crew, had a flawless launch, and achieved an initial orbital of 220.8 by 185.07 km at the desired inclination of 51.80 degrees, with the period of the first orbit being 88.6 minutes. The Apollo was launched 7.5 hours later, with a three man crew who maneuvered their spacecraft into a proper configuration for docking with the Soyuz. The docking occurred on the third flight day, 17 July 1975. After docking, crew transfers took place, with the Apollo crew first visiting the Soyuz. Leonov was on the American side for 5 hours, 43 minutes, while Kubasov spent 4:57 in the command and docking modules. The combined Apollo-Soyuz crews conducted various mainly ceremonial activities, performed joint experiments, and presented radio and TV reports. After the joint experiments were completed, the spacecraft disengaged, and each continued its separate mission. After being docked for nearly 44 hours, Apollo and Soyuz parted for the first time and were station-keeping at a range of 50 meters. The Apollo crew placed its craft between Soyuz and the Sun so that the diameter of the service module formed a disk which blocked out the Sun, creating an artificial solar eclipse so the Soyuz crew could take photographs of the solar corona. 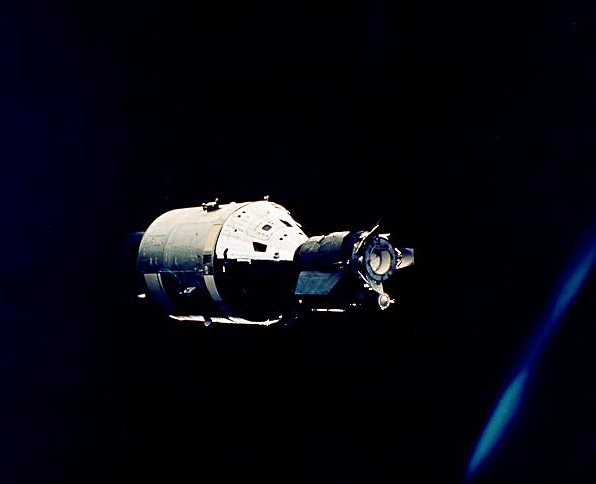 After this experiment Soyuz moved toward Apollo as the active ship for the second docking. Three hours later Apollo and Soyuz undocked for the second and final time. The spacecraft were moved to a 40 meter station-keeping distance to perform an ultraviolet absorption experiment. With all the joint flight activities completed, the ships then went on their separate ways. Soyuz 19 landed safely in Kazakhstan on 21 July 1975. NASA launched Apollo-ASTP (Apollo 18) from Cape Canaveral, Florida, the American half of the Apollo-Soyuz Test Project, in preparation for the unprecedented international docking of their spacecraft two days later. The crew of Apollo-ASTP discovered a mosquito "stowaway" had flown to space with them during the Apollo/Soyuz mission. The US Air Force launched AMS 5 from Vandenberg, California, a Defense Meteorological Satellite Program spacecraft destroyed by poorly designed connectors between the second and third stages that ripped the wiring out of the spacecraft. During the 5h 56m Mir EO-9-3 EVA, Mir cosmonauts Anatoly Artsebarsky and Sergei Krikalev began the Sofora girder construction and installed the Sofora mounting platform. A Kosmos-3M launched from Plesetsk carried the Italian Space Agency MITA microsatellite (NINA particle detector, experimental attitude control system), Germany's CHAMP geophysics research satellite, and Germany's Rubin technology microsatellite to orbit. During the 5h 56m STS-104-1 EVA, astronauts Gernhardt and Reilly removed Quest airlock module thermal covers, installed handrails and oxygen and nitrogen tanks. The ISS RMS docked Quest to Unity, the crew returned just over an hour after bolting it down. NASA launched the Aura satellite from Vandenburg, California, to study atmosphere dynamics and chemistry.